Derbyshire is a highly important region within the glorious confines of the British Isles. Contained within the relatively short boundaries of the county is a major portion of the Peak District National Park. Here, many farmers raising some of the most exceptional meats can be found. By keeping the grazing on these areas of natural beauty, animals such as various breeds of sheep and their glorious young can roam and travel freely. Often nibbling and consuming fresh and wild mountain herbs, the glorious taste of these meats cannot be overestimated. Derbyshire offers such wondrous produce, which can be found all over the county. By utilising the ancient and excellent method of flame roasting slowly, our whole carcasses can serve huge numbers of people at your event. Many catering firms out there just get the job done. We believe that by going the extra mile we can help to give people what they deserve at their chosen event – which is food that is un-beatable. By sticking to the principles of slow roasting over flames, combined with the most loving approach as regards how we prepare our meats, we have helped to create a culture that loves eating the food which we create. Found in the East Midlands, Derbyshire is partially home to the Peak District. With its multiple scenic locations, there is a lot that the people of Derbyshire can be grateful for and they can enjoy the sublime hog roast catering which we are proud to provide. It doesn’t matter where in Derbyshire you require hog roast catering, because we are able to supply our services all around the county. If you are situated in South Derbyshire or even High Peak this is not a problem for us because we are able to supply our assistance in a variety of locations. Even if you require catering for a small family gathering in a tiny village which has a population of only a few hundred or even if you need help catering in a medium sized town, this is not a problem for us because we have extensive experience of supplying our services for all kinds of social functions. 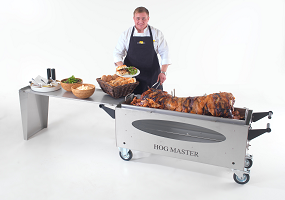 Hog roast catering is where a pig is succulently cooked using our fantastic machines that we have invested significant amounts of money in. Our machines are able to cook your meat in such a way that even the scent of the meat will be spellbinding. In order to cook your pig, we arrive with plenty of time to spare. This has seemed surprising to many of our customers as they believed that it would arrive partially cooked. In fact, we are a firm believer in making sure that the meat is cooked to perfection on site as this can help to create a scent which is difficult to match anywhere else. In all, we have a proven track record of supplying our services for a wide number of social functions. Whether this is a party that is being held in honour of a birthday, a wedding reception that’s taking place in a stately home or even an anniversary party which is being held in the back garden of a council estate we have extensive knowledge that is bound to surprise you. By browsing through our menus, you can see for yourself about what we can actually serve to you long before we actually arrive. Therefore, when we turn up you won’t be surprised with what we are serving as you will know exactly what we are preparing for you. The aforementioned social occasions which we can provide our hog roast catering services for normally take place long after the sun has set. However, if you require a morning or even a midday function to be a complete success we can offer our services at that time of the day. This is perfect for when you want a corporate meeting to be a triumph or for a business conference to be amazing. Important clients will be suitably impressed with the feast that we can provide especially when they catch the aforementioned scent. Furthermore, as our assistance can be provided at any time of the day what we serve will more than likely compensate for a soggy piece of toast for breakfast or a limp sandwich at lunch. By having a hot meal during this early part of the day will satisfy your hunger. The prices which we charge for our services are surprisingly affordable. Unlike what other caterers might offer, the amounts which we charge are amazing and can therefore fit into your budget. After all, if you ask your guests if they like hog roast catering there will be nearly all or even a large majority who will admit to loving hog roast food. Choosing our services over others will mean that your social function in Derbyshire will be remembered for a very long time even in the weeks and months after it actually ended. To find out more information about how we can help to make your social function a hit, contact us sooner rather than later. We aim to provide superb satisfaction time after time just like we have done for a countless number of customers and businesses. We look forward to hearing from you and hope to serve fantastic hog roast meat in the near future at your event.